Is Mysterious 'Eric Hoteham' Actually Longtime Clinton Aide Eric Hothem? Is the Mysterious ‘Eric Hoteham’ Actually Longtime Clinton Aide Eric Hothem? The name of the mysterious individual who registered the servers for Hillary Clinton’s private email address used at the State Department bears a striking resemblance to a longtime Clinton aide. Clinton and her top aides in the State Department were using email addresses on a private server registered to the Clinton’s home in Chappaqua, New York, according to Internet records reviewed by the Associated Press. The customer listed in records registering the Internet address to the Chappaqua home was "Eric Hoteham." The AP, however, was unable to identify an "Eric Hoteham," stating that the "name does not appear in public records databases, campaign contribution records, or Internet background searches." But the name is similar to that of Eric Hothem, who worked as a staff assistant for Clinton during her time as First Lady. The name of the account was "E.C. 934(A) c/o Eric Hothem." Lawyers told the committee that "the account is a personal Citibank account of former President and Senator Clinton" and that the money was a loan for Roger Clinton to obtain legal counsel for the investigation. The congressional report points out that the "payment occurred at the height of public outcry and investigative activity regarding the pardons and at a time when Roger Clinton was deciding whether to provide testimony." According to accounts of the final days of the Clinton administration, Hothem told chief White House usher Gary Walters that multiple items of furniture were "the Clintons’ personal property" even though they were not. 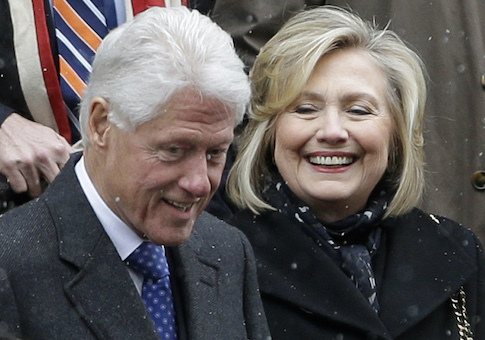 The Clintons would later have to return or pay for more than $100,000 in furnishings stolen from the White House. Hothem also received a special acknowledgement in Hillary Clinton’s book Living History. Hothem went to work for Citigroup, then moved to JP Morgan Chase in 2013, according to public disclosure reports accessed through the Securities and Exchange Commission. The documents indicate that Hothem began his financial career in 2002, just a year after his last documented work as an aide to Clinton. Members of Hothem's JP Morgan office in Washington, D.C., said on Wednesday that they had "no comment" to any questions regarding Hothem and directed the Washington Free Beacon to the company’s media relations department. Inquiries made to media relations were not answered by press time. An email sent to an account believed to be Hothem's was also not returned. An analysis of Clinton’s personal financial disclosure forms shows she maintained accounts worth millions of dollars at Citibank throughout her years in the Senate. She moved her largest accounts to JP Morgan in 2009. Her most recent available public financial disclosure in 2012 shows that she holds up to $25 million worth of assets in a JP Morgan account. Hothem did not make the switch to JP Morgan until Clinton was out of federal office in May 2013. Hothem has maintained ties to Democratic campaigns. His wife, Sue Hothem, has "raised millions of dollars in political contributions," and helped found a political action committee worth nearly $1 million. She was also the director of development Democratic Leadership Council and the Progressive Policy Institute. The Clinton Foundation did not respond to a request for comment by press time.